To non-professionals, it looks like a disaster: The Höegh Osaka, a large car-carrier currently sitting lopsided in shallow water off the port of Southampton, was beached by its crew on Saturday night and images of the ship — just sitting there, half-sunk in the Solent — have dominated the UK media ever since. But the deliberate decision to run the boat aground was not an unhappy accident. Rather, it was a mastery of piloting and ship handling. 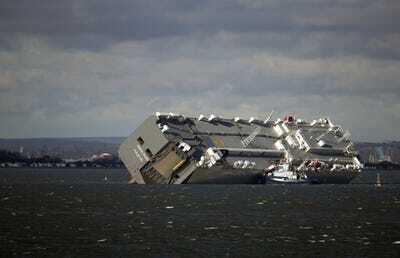 “Things could have been much worse,” says the chairman of the UK Maritime Pilots’ Association (UKMPA). 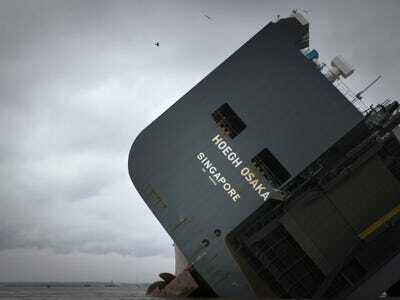 The ship’s company said in a statement that the captain and the pilot of the Höegh Osaka noticed that the ship was dangerously listing to one side, and decided to strand her deliberately in order to prevent further damage. Business Insider spoke with Captain Don Cockrill, a professional pilot at the Port of London and chairman of UKMPA, to figure out what actually happened on board. “The quick thinking, decisions and actions of the Southampton port pilot on board the Höegh Osaka with the ship’s captain and his team resulted not only in the prevention of a major catastrophic event for the ship, but most importantly, saving the lives of the 25 crew members.” he said. Cockrill explained that every time a ship of that size is leaving a port, the captain is helped by a professional pilot from the same port, who literally drives the vessel to safe waters. 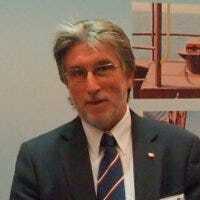 It is a tough job: “ships grow bigger and bigger, but the ports have remained the same as decades ago,” Cockrill said. It is like having the same garage, but buying a larger car: it might fit, but it’s harder to drive in. 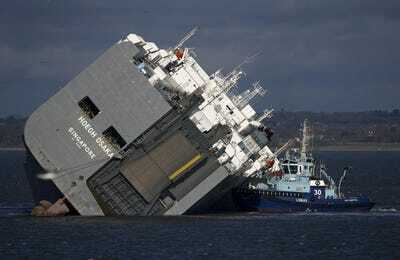 Cockrill reconstructed what happened on the Höegh Osaka on Saturday night: the operators would have rapidly realised that something was going wrong and the ship was listing dangerously. Before losing control of the vessel, the pilot and the captain decided to run aground on shallow waters, where the bottom of the sea is higher and the Höegh Osaka could easily be stranded safely. The ship left port at 8.20 p.m., it was stranded by 9.30 p.m. — meaning the pilot and captain took only 70 minutes to realise the ship was in jeopardy, decide they had to beach the vessel, give orders to the crew, plot a course to the bank, and then successful “park” the ship on top of it. 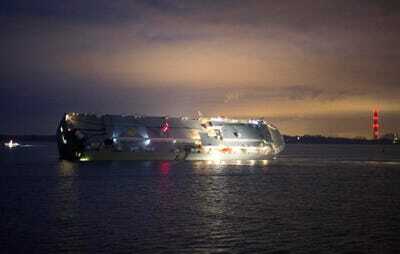 As well as lowering the safety risk for the crew, it also kept the navigation channel towards the port open. In fact Southampton port is now operating as per usual — despite the massive shipwreck a few hundred yards from its mouth. If the ship had capsized, the crew’s lives would have been at serious risk; the cargo likely lost; and Southampton port would have been clogged for days. “Thankfully, there was a very expert pilot on board, who knew what he was doing,” Cockrill said. On Monday salvage experts from Svitzer, a vessel rescuing company, were on board the Höegh Osaka to assess the damage and inspect the cargo, the BBC reported. Although neither the cargo or the ship seem to be badly damage at the moment, rescue operations could last for months as weather conditions are expected to get worse in the next few days preventing the rescue, The Telegraph wrote. There are about 1,400 vehicles on board, including 1,200 Jaguar and Land Rover first-class cars, 65 BMW Minis, and 105 JCB agricultural machines.